When Tomatin Distillery was established in 1897, the isolated and idyllic setting of Tomatin was almost perfect. However there wasn’t a local workforce; the local inhabitants were scattered shepherds and cattle drovers. The company began a project of construction to accommodate its workforce. Since that time the distillery has been at the heart of the community and the community at the heart of the distillery. 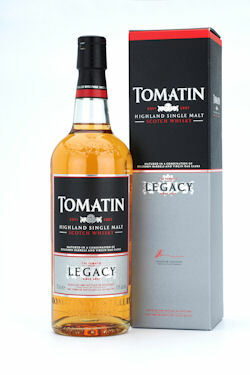 This legacy has continued - Tomatin remains one of the few distilleries to provide a home for its dedicated craftsmen - and is now recognised with a permanent addition to the Tomatin Highland Single Malt Scotch Whisky range, “The Tomatin Legacy”. Cask Type: Matured in a combination of Bourbon barrels and Virgin Oak casks Strength: 43% alc./vol. Vanilla pods, marshmallow, sponge cake and fresh pineapple, mixed with citrus lemon and boiled sweets. Light and delicate with a candy sweetness which is peppered with hints of pine. Lemon sherbet, pineapple and crunchy green apples with a touch of freshly baked sponge cake.